Today marks the 6 ear anniversary of Ohiophotogrls moms death. So we took flowers out to the grave site. Mrs Opal P. Collins left this world way before any of us were ready for her to go. She never knew a stranger and she always left people with a kind word. Ohiophotogrl talks about her a lot. She thinks that Mrs Opal would have loved to see all the places that she takes me. 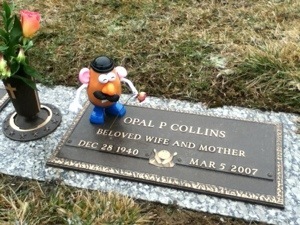 Mrs Opal loved to laugh. There are many people that miss her everyday. But to know that she isn’t in pain any more gives us a calming peace. “I love you mom! I miss you every moment of everyday. Keep watch over dad like I know you already do. Watch over Kiki and Huck. The girls are doing well and growing like weeds but you know that too because I can feel you near them always. Your friends miss you too. They say I look and act just like you:0). I hope I haven’t let you down. I love you mom! Today, tomorrow, and always! Then we went to check on PopPop. He is sad today too. We will go on but there is a whole in our hearts that will always remain. RIP Mom Collins. Enjoy your day with the angles. This entry was tagged 365, blogging, fun, kid friendly, laughter, love, memories, Mr. Potato Head, muse, respect. Bookmark the permalink.